The first-of-its-kind automotive awards saw more than 35 OEMs take part in it in order to find the top picks of the Indian pre-owned vehicle industry. We've come across numerous automotive awards which identify the best vehicles that have been launched in the country year after year. However, when it comes to the pre-owned vehicle industry, we do not see much in terms of recognition due to the fact that it is an unregulated industry in our country. Nevertheless, Droom decided to rise to the occasion and on 11th December 2018, organised the country's premier automotive awards to reward the best picks of the pre-owned vehicle industry. Hosted by Bollywood actor Aparshakti Khurana and renowned journalist Aabha Bakaya, the event took place in the presence of esteemed names from the automotive industry like Mr Sunil Munjal (Chairman – Hero Enterprise) and Mr Jagdish Khattar, former MD of Maruti Udyog Ltd.
With a jury panel consisting of esteemed and established names from the automotive journalism and motorsport industry, the panel chose the best from four major categories – Jury’s Choice, Buyer’s Choice, Dealer’s Choice, and Best of Droom – with each category further divided into ten sub-categories. The awards received good response from the industry, with 110+ nominations from 35+ Original Equipment Manufacturers (OEMs). 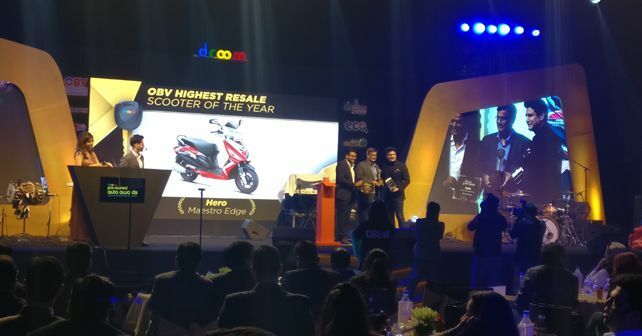 Among the two-wheeler stalwarts present, Hero MotoCorp bagged the most silverware, with Hero Splendor Plus named the ‘Most Sold Bike on Droom’, Hero Maestro Edge winning the ‘OBV Highest Resale Scooter of the Year’ and Hero Electric Optima E2 taking home the ‘Jury’s Choice Electric Scooter of the Year’. In the arena of four-wheelers, the Honda City claimed the ‘Dealer's Choice Sedan of the Year’ while Mercedes Benz C-Class emerged as the dealers’ favourite by winning the ‘Dealer’s Choice Luxury Car of the Year’. Hero MotoCorp bagged the most prizes across categories and was named the ‘OEM of the Year’ for two-wheelers. Speaking on the occasion, Mr Sandeep Aggarwal, Founder and CEO of Droom said, 'India is the 3rd largest automobile market in the world. Since 2013, the number of used vehicles sold has been higher than the new vehicles sold in India. However, most of the ecosystem is still aligned with new vehicles. With Droom Pre Owned Automotive Awards, we are increasing the sense of joy and pride in owning a pre-owned vehicle and making it more celebratory.' Mr Aggarwal also stated that the Droom team spent 15 months in order to organise the event.